This is my first review of a local restaurant, which seems odd to me, but I guess usually my posts have been about trips or things I make. I had heard about 5Church from my friend Jon, also a big foodie and Top Chef fan. It’s located at 5th and Church streets here in Charlotte, go figure. It’s three investors with Chef Jaime Lynch, who was the chef at Barrington’s (special occasion place, so delicious) here in town and has also worked at Le Cirque. I did notice that evening that two of the three investors were in the house. I had high hopes for this restaurant based on the design of the website, word of mouth, and the menu. The decor is very NY chic which I love. Great bar area. What I didn’t love about the decor was the leucite clear chairs. They just aren’t comfortable. I like to sit and enjoy the ambiance and these chairs make me want to flee. Our waiter was good…but only after we asked for specials or his recommendations on the menu. 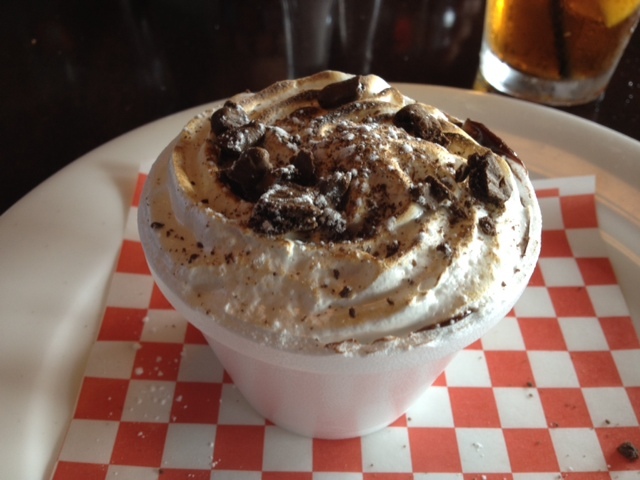 I am a firm believer that waiters should help guide your experience of a new restaurant. The menu had snacks, first course, steaks, and the main course. I inquired what the snacks were and how big they were…he told me a few bites. 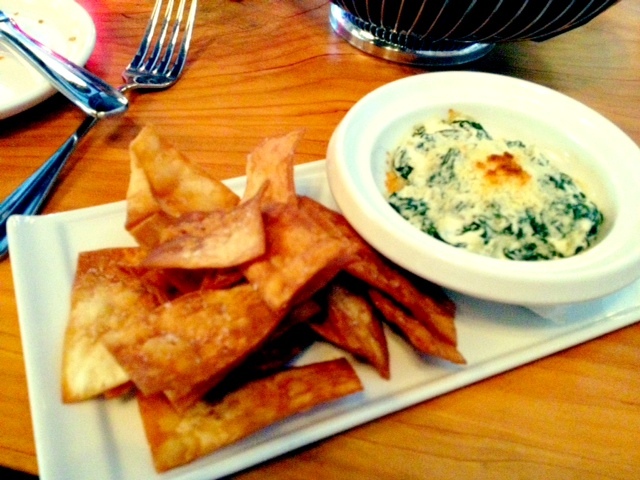 I ordered the baked goat cheese and spinach. I kind of thought it would be more like a salad but it was more like a dip. Good and tasty, but not what I expected. 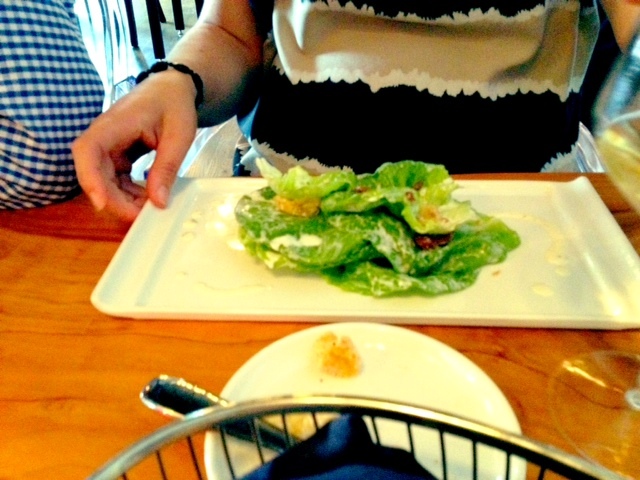 My friend Kelly, ordered the Bibb Salad, which also looked delicious. She crushed it. I was jealous. The boys both ordered the hummus which looked a lot like the dip I had. I got the Maine Skate. 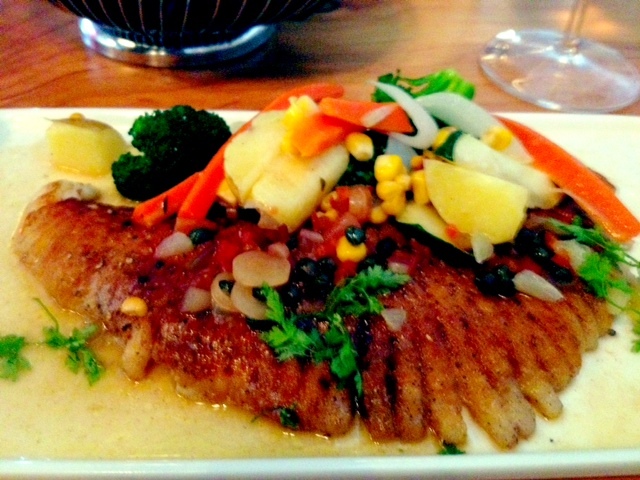 I lovely white fish with pickled ramp brown butter and fresh veggies. It was lovely and cooked perfectly. 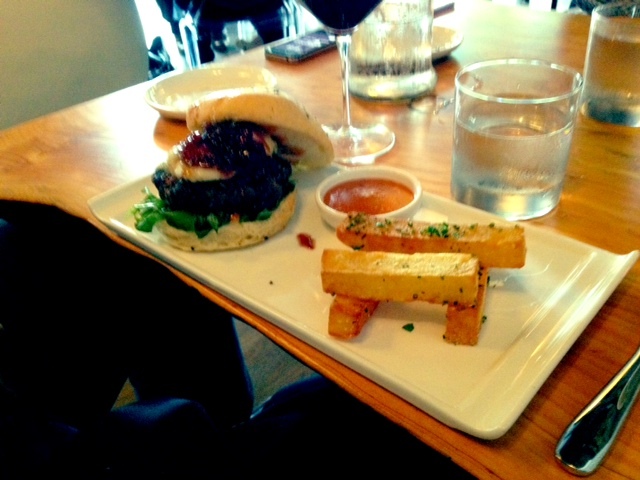 The boyfriend had the lamb burger, which looked awesome. The pink sauce was like a homemade ketchup which I tested…spicy and yummy. 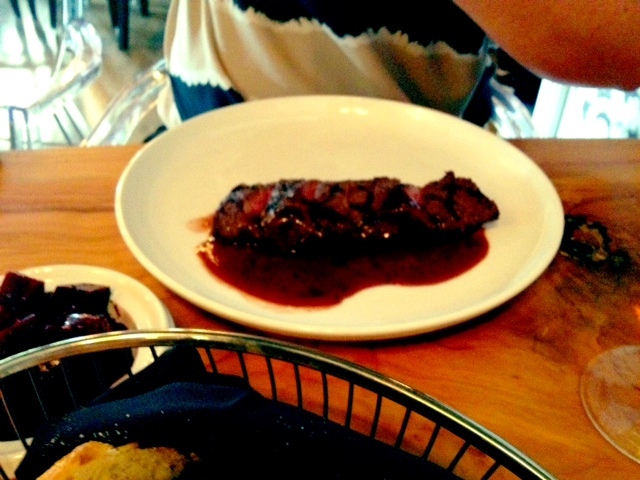 Our two friends had the Hangar steak and it looked awesome. All in all, it was a good dinner and I will consider coming back. The location is fantastic as it’s right up the street from the Blumenthal Performing Arts center…where we took in Aziz Ansari immediately following. He’s a funny guy…and a foodie too! Try Savor on Morehead. It’s delicious. My favorite is the mojo chicken sandwich and the chocolate banana pudding. It’s amazing. Also, try Mattie’s diner at the NC Music Factory. I had a bite of this meatloaf and it was awesome. 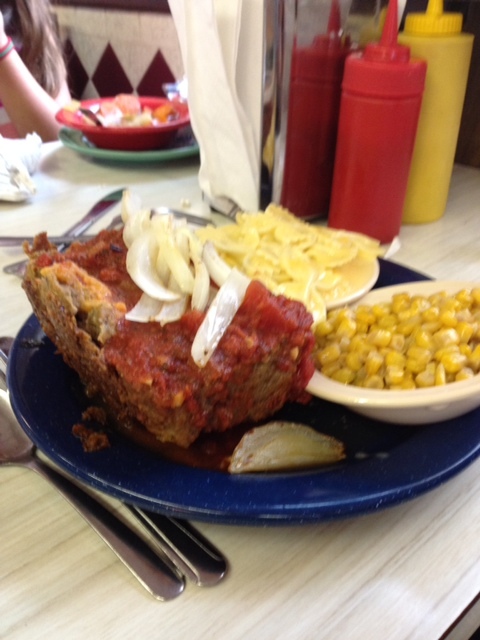 I had a turkey wrap, which was ok…but I will be getting this meatloaf next time.